I’m writing this mainly for a friend, but after looking into the subject, I figured my site could use a bit of information on the matter as well. Windows 8 releases tomorrow and as expected, it comes in multiple flavors depending on your specific needs. There are some key differences between them, so listen up! Windows 8 – Available in 32 and 64 bit versions, Windows 8 is the most basic edition you can get. It features all of the most essential requirements a typical home user would need like live tiles, Windows Store, Internet Explorer 10, Microsoft account integration, the standard desktop, etc. Windows 8 is the direct replacement of Windows 7 Home Basic. Windows 8 Pro – Windows 8 Pro also comes in both 32 and 64 bit versions and includes everything Windows 8 has, but it adds more business-like features such as Remote Desktop, Windows server domain compatibility, encrypted file system, Hyper-V, Virtual Hard Disk booting, Group Policy and BitLocker. Media Center can be added to Windows 8 Pro as a free add-on. 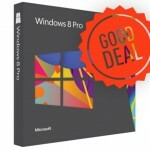 Windows 8 Pro is a direct replacement of Windows 7 Pro and Ultimate editions. Windows 8 Enterprise – This edition will be much harder to find as it’s only intended for high-end corporate networks that require more than what Pro can do. Enterprise includes everything that Pro has (minus Media Center capabilities) and adds features like Windows To Go, DirectAccess and BranchCache. Windows 8 RT – Windows 8 RT will only be available on ARM devices such as tablets and other mobile devices. RT features touch-optimized apps such as Office 2013 RT which ships free with Widows 8 RT. As you can see by this list, Windows RT is considered to be the mobile version of Windows 8. The most notable difference will be how you get apps. On a typical Windows PC, to get software, you can download it or install it from a disc or local network share. On a Windows RT device, the only way to get software is to buy it from the Windows Store. This is because Windows 8 RT only has a partial desktop. Let’s compare this setup to Apple. Apple makes computers and tablets. On their computers, they offer a full operating system called OSX (current version is 10.8.2, codenamed Mountain Lion), while on their tablets, they offer a mobile operating system called iOS (current version is 6.0.1). There are many things that can’t be done in iOS as compared to OSX. 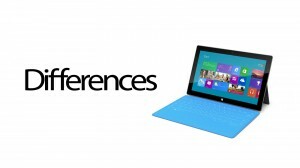 So, if you’re planning on getting the Microsoft Surface, consider your choice. If you’re looking to have to a direct copy of your Windows 8 desktop with all the same features and the ability to install software not from the Windows Store, you should wait until the next version of Surface comes out (hopefully soon). But take into consideration that while RT comes with a free version of Office 2013 RT, the regular version of Office 2013 will cost you. I hope I like Windows 8 after I upgrade my desktop tomorrow. If I do, then I might consider buying a Microsoft Surface with full blown Windows 8 in order to have a device that syncs everything with my desktop. On the other hand, if Windows 8 doesn’t do much for me in the way of syncing my life as it is, I might just stick with Android on a new Nexus device although I’m hearing about a program called BlueStacks that allows Android apps to run on Windows 8!! This month has so many new things coming out…the choices are endless! Then again, there’s always the $8,000 touch-screen table that has a computer in it. As we all know, Windows 8 is set to be released on October 26th and Amazon has the best price so far. Of course they’re adding to this by offering a free $30 store credit that can be used on any item Amazon ships!! This does mean that you can’t order from Amazon customer’s stores, but who cares. Amazon still offers the best deal given the extra $30 store credit as well as the pre-order price guarantee which protects you from over-paying. In other words, if you order it at today’s price and the price goes lower before it ships, you get the new price. The best part is that it can never go back up again. Just like in the past, Microsoft feels the need to release multiple flavors of the same OS to market the various demographics that will use it, so this time around, we’re looking at four different versions. Windows 8 – This is the most basic version and is the equivalent of a home edition of Windows. 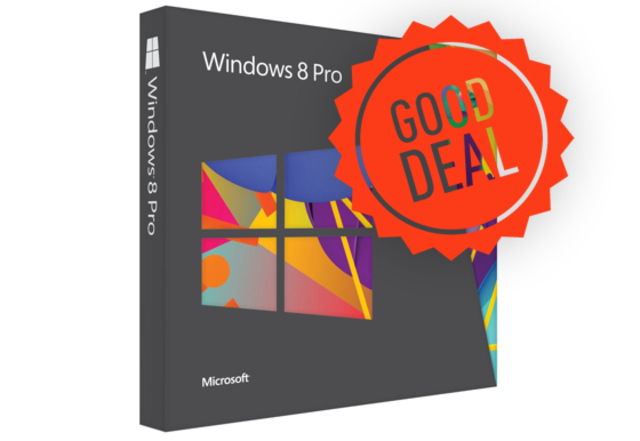 Windows 8 Pro – The direct upgrade from Windows 7 Pro and Ultimate which includes additional features such as domain compatibility, remote desktop, Windows Media Center, etc. Windows 8 Enterprise – Mostly the same as Pro (without Media Center), but comes with added features that would only be useful for IT professionals running large network environments. Windows RT – This is the “mobile” version you’ll find on the lower end Surface tablets and other ARM-based devices. A more detailed look at the different versions can be found at Wikipedia. I’ve used the beta version of Windows 8 and I have to say, I really liked it. There’s some debate in the PC world whether Windows 8 will be a flop or not because of the new tile system they’re going with, but I can assure you that the tile system is more of a skin than anything else. In fact, if you prefer the standard desktop, you can bring that back with no issues. Only time will tell how Windows 8 fairs in the marketplace and I plan to do a full write-up once I get my copy installed. The MT55 Platform is the latest in tech gear that you’re going to want for your living room, but probably will never buy. That’s because it costs as much as a low-end car. However, its manufacturer, Ideum thinks otherwise. Most people will eat their breakfast off an average wooden table that does nothing for you except collect dust and get messy from time to time. The new MT55 Platform will do both of those, but also show you the Internet at the same time! 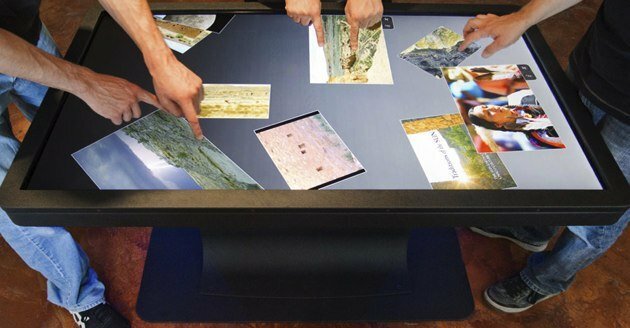 This table is no doubt awesome, but couldn’t you just buy a big touch screen and lay it flat? Then again, I guess 55″ 1080p touch screens just aren’t that popular yet. This is just one of those items that you would buy if you had money to burn after you bought every other useless tech item you could think of. I don’t mean to imply that this thing is actually “useless” because after all, it is a working computer with its i5 processor and 8GB of RAM. But $18,000 just to stare down into your work while you manipulate windows around with the swipe of your fingers?? I doubt it’s worth that much. The only silver lining to this is that if Apple ever made one, it would probably cost 3-4 times more.